The top BBQ caterers in Toronto will be the life of any party - they'll bring billowing towers of meat-scented smoke, signaling the arrival of mouth-watering ribs, bark-encrusted brisket and juicy pulled pork. Some will even cook a whole hog before your eyes on a rotating spit - it's as much about showmanship as it is about supremely tasty eats. They're all ready to turn up the heat at your next corporate event, wedding, block party or backyard picnic. Here are my picks for the top BBQ caterers in Toronto. This food truck serves up some of the finest Texas BBQ in Toronto - booking pit master Adam Skelly for an event, wedding or backyard barbecue is a surefire way to impress guests. 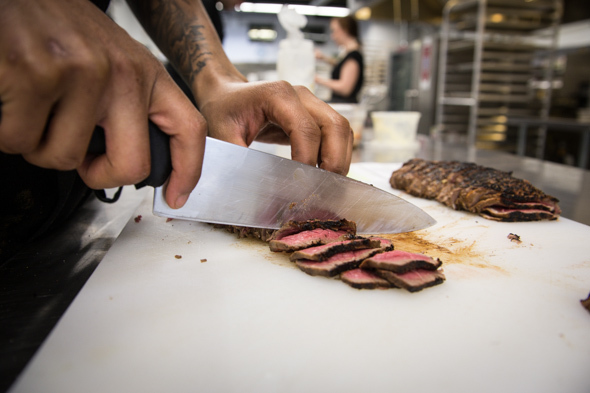 For effect, have the truck with barrel smoker pull up on site and dish out sandwiches and salads through the service window, or opt for a meat buffet staffed by carvers who will assemble platters of brisket, ribs and sausages. For fancy occasions, inquire about canapes, like two-bite pulled pork tacos on fried wontons and mini fried chicken and waffles with maple. Bonus points for a Pinterest-worthy set-up. Known for Carolina-style 'cue, the Pork Ninjas specialize in moist, ethically-raised meats (their motto is "happy animals taste better"), that are slow-cooked over charcoal and sauced with traditional vinegar, mustard or piedmont (ketchup-based) BBQ sauces. In addition to top cuts of meat like apple-smoked pulled pork, baby back ribs and hickory-smoked brisket burnt ends, you can even order a whole roasted hog encased in crackling skin. All the fixin's are on offer, too, including sides like smoked potato salad, cheesy jalapeno cornbread or stuffed portobello mushrooms cap. You can opt for a fully staffed buffet or family-style service for parties of 24 up to 250 guests. For smaller parties, it's easy enough to pick up "Pig Out Platters" from the Queen East restaurant - they come loaded with a sampling of pulled pork, brisket, smoked wings, smoked chickens and racks of pork or beef ribs, plus all the fixin's. Larger parties of up to 600 guests can have a buffet or charcuterie-style boards catered, or for a minimum of 100 guests, you can book the truck to roll in. They'll even do off-menu items on request, like seafood or whole hogs wood-fired onsite. Based in Parkdale and serving the GTA, this events-only company offers a focused menu that favours a distinct Central Texas style of BBQ. Treat guests to specialties like pepper-encrusted beef brisket, coffee-rubbed pulled pork and Chinese five spice pork belly, all lovingly bathed in thick natural hardwood smoke. Round out the feast with sides like baked beans specked with burnt ends, or roasted corn seasoned with masala and parmesan. 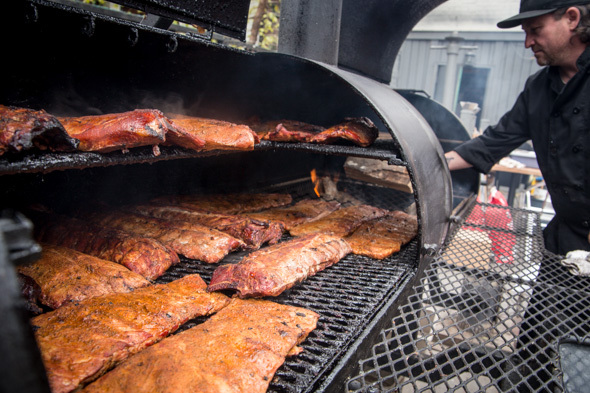 Pit master Nick Chen-Yin can accommodate parties of 60 up to 350 guests. This Hamilton-based food truck is more than willing to travel to the GTA for parties of up to 400+ guests. On request, they'll even trailer a 9-foot-long barrel smoker to outdoor venues, from which they smoke a mighty selection of meats over apple, cherry or pear wood. Customizable menus offer selections like ribs and burnt ends, or make it a handheld affair with Carolina pulled pork sandwiches or brisket melts on toasted buns. For dessert consider booking sister food truck, The Hamilton Funnel Cake Factory. This 22-foot mobile kitchen will serve its signature pulled pork parfait from the walk-up window (just like at a food truck rally) or lay out a buffet line full of sliced beef brisket, St. Louis cut ribs, smoked chicken and juicy sausages. Book the truck for an office picnic or tailgate party for up to 500 pounds of competition-grade BBQ cooked on-site or delivered for drop-off. Three BBQ joints in Whitby and Oshawa are known for fine smoked fare and are capable of offering full-service catering operations. Owner Darryl Koster honours family recipes honed whilst competing on the southern United States competition BBQ circuit. 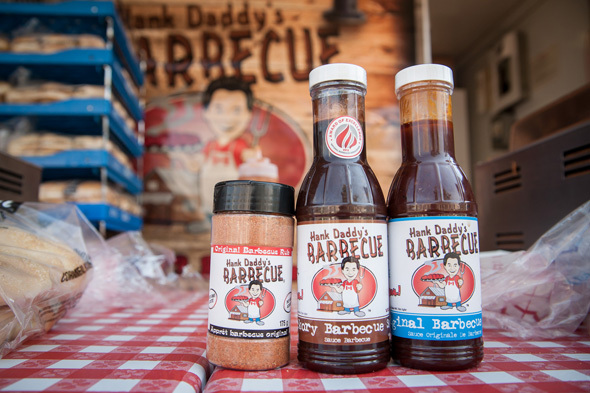 Now available at private events, enjoy specialties like baby back ribs, brisket and pulled pork, along with award-winning seasoning rubs and championship BBQ sauces. This food truck is happy to pull up for private events and offers the choice to build your own menu, or select from pre-set packages for everything from three-course lunches or dinners to late-night snack services. A sample menu offers a choice of traditional and fusion BBQ items like Texas brisket, grilled cheese with brisket sandwiches, pulled pork tacos and grilled portobello mushroom sandwiches. For outdoor events including large corporate barbecues and weddings, as well as smaller, more intimate, backyard barbecues or cocktail parties, this BBQ caterer offers everything you'll need to make any event a success. Theme packages with all the fixin's are available in options like the Western Stampede (featuring aged prime rib roast and baby back ribs) or "Heavenly Hawaiian" (showcasing sweet and sour pork, grilled pineapple and Polynesian shrimp rice). Professional grill chefs and buffet serving staff are included with each package, and at an additional charge they'll arrange everything else, including bartenders and alcohol service and rentals. This full-service catering company has the ability to handle large-scale events for up to 2000 guests, be it a fancy sit-down dinner or a fun outdoor block party - they've even got service rentals and staffing needs covered. Menus are tailored to each event and have been known to feature whole smoked chickens and 24-hour braised baby back ribs, served buffet-style or at "butcher block" food stations where meat is carved to order. Smaller parties can generally manage with little notice by picking up grab-and-go selections from the retail side of the production kitchen on Carlaw. The catering division of Big Bone BBQ and Memphis BBQ restaurants specializes in on-site catering designed for groups of 50 to 1000 people. Party menus are fully customizable, showcasing a wide selection of Southern specialties like smoked ribs and wings, plus crowd-pleasing favourites from the grill, like burgers and hot dogs, and a full array of side dishes and cold salads. Build your own dream BBQ meal, or make it simple with pre-selected menus from this barbecue catering specialist - they're flexible enough to accommodate parties from 50 to 5000 people. Order slow-smoked favourites like chicken or ribs that are finished with a turn on the grill, or go for a show-stopping feast like the pig roast menu, which stars a whole deboned hog, spit-roasted and sliced. Did we miss any? Leave your favourite BBQ caterer in the comments.